Gums and patches don't reduce your dependency on nicotine. They just allow your body to get it from another source. 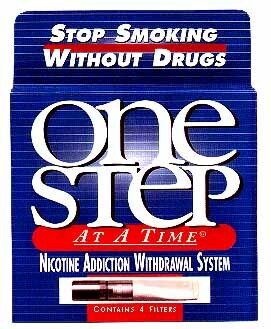 One Step at a Time cigarette filters lower your nicotine dependency in gradual increments. It offers a proven way to conquer your addiction. Without patches. Without gums. Without doctors. Without costly reconditioning programs. The system consists of four filters, each to be used 7 to 14 days. will be eliminating up to 90% of the nicotine and tars. One Step at a Time comes with the four filters, plus you'll get a 20 page booklet with details on how the filters work, how to use the filters, plus four steps to a smoke-free life. You'll even learn how to clean the filters, to extend their effectiveness and make them work over and over again to help you quit! Best $20 I ever spent!!! !